When the average middle school student studies the origins of slavery in Colonial America, they may establish a timeline of important events, research the historical significance of the triangular trade system, and read firsthand accounts of enslaved African Americans. 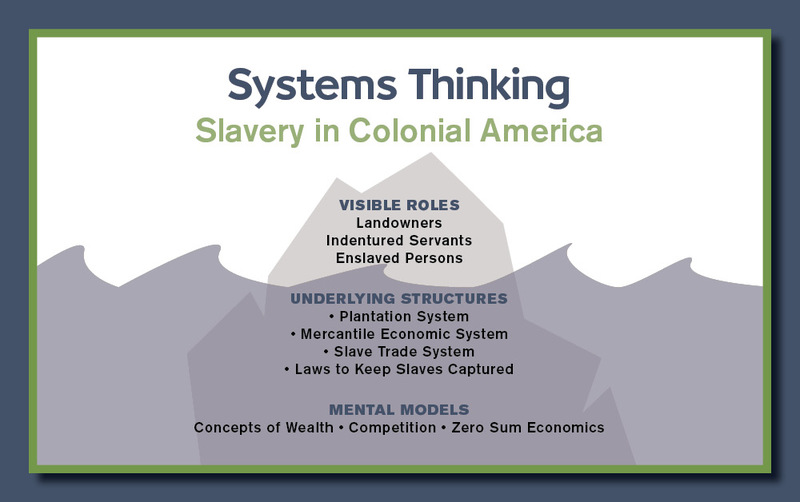 Willow’s Grade 8 students add Systems Thinking to their analysis and understanding of this critical topic, which leads them to a deeper understanding of the role slavery played in the development of the United States. The iceberg chart exercise begins with students discussing and lists the visible aspects of colonial society at the top of the chart: landowners, indentured servants, and enslaved persons. This is what lies “above the water line” - and often, it’s where students’ understanding of historical events ends. But not at Willow. The iceberg exercise challenges students to then examine the systems and structures that facilitated slavery; what lies below the surface. Students discussed and listed the plantation system, the mercantile economic system, the system of laws that kept enslaved persons captive for life, and the transatlantic slave trade system. The class also used behavior over time graphs, another Systems Thinking tool, to better understand how the structures interacted with each other and strengthened each other over time. Eighth graders then delved even deeper into the type of thinking that generated these systems in the first place, from the concept of wealth as money and property versus the well-being of the community to seeing competition as a necessity for success and the ideas that there must be winners and losers in a cultural exchange. These ways of thinking (and many more) helped created the systems that made slavery an institution in 17th and 18th century America. Get our FREE guide Systems Thinking: The Essential Academic School Every Student Needs, Yet Few Schools Teach. We will email it to you immediately! Willow’s Grade 8 students are equipped to conduct this kind of complex analysis because they have engaged with Systems Thinking beginning in lower school. The Grade 5 study of the Agricultural Revolution, for instance, tasked students with formulating a sustainable solution that would lessen the revolution’s impact on the environment. In an environmental study in Grade 6, Systems Thinking helped students consider the issue of a polluted river more fully. 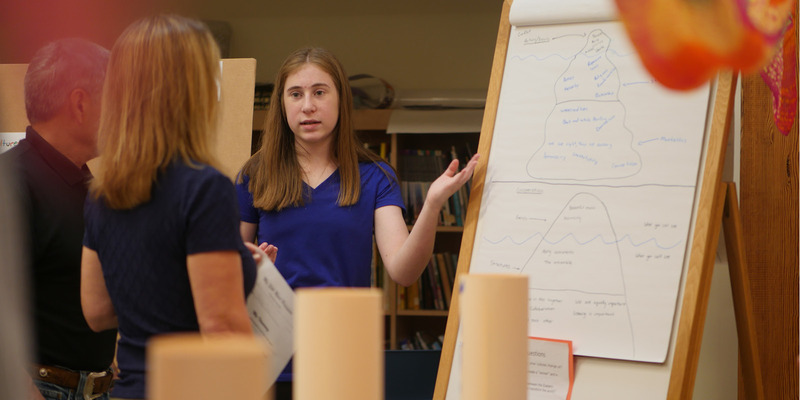 The use of the iceberg chart and other tools led students to the reasoned conclusion that it was fruitless to clean up pollution downstream unless the root causes occurring upstream are effectively addressed. At Willow, this type of thinking begins in kindergarten, when students are first introduced to the concept of a system: their classroom. Students are taught to step back, see the bigger picture, and understand how they can make a difference using Systems Thinking, even at this young age. See Systems Thinking in action! Take a tour of Willow. Click here to request a tour online.